Trends change every year. There is nothing as constant when it comes to trends. No matter to which industry do you belong, every industry has got its own trends which do get both changed and advanced every year. Talking about the WEBSITE DESIGNING COMPANY, it is now no more an unknown industry to a layman. With everything coming online the demand of WEBSITE DEVELOPMENT companies has increased at alarming rates. With the rapid growth of ecommerce industry, the industry has attracted attention of a lot start-ups and well established businesses. This has not only helped in creating a boom in the ecommerce industry but has also increased the competition in this industry. To outshine in this competition one needs competitive ideas and needs to be updated with all what’s going around. To keep up with the competition all you need in this industry is a good website. A website that is up to date and follows the WEBSITE DESIGN TRENDS OF 2018. It’s the trends that help an ecommerce to grab the attention of the customers and retain them. In the ecommerce industry your products and websites play a pivotal role as a customer is only able to view your products and website and not feel them by touch physically. So the WEBSITE DESIGNS hold a great importance as the website needs to be eye pleasing. What pleases the eye is actually what attracts a viewer. The Responsiveness of a website plays a pivotal role in developing a website. 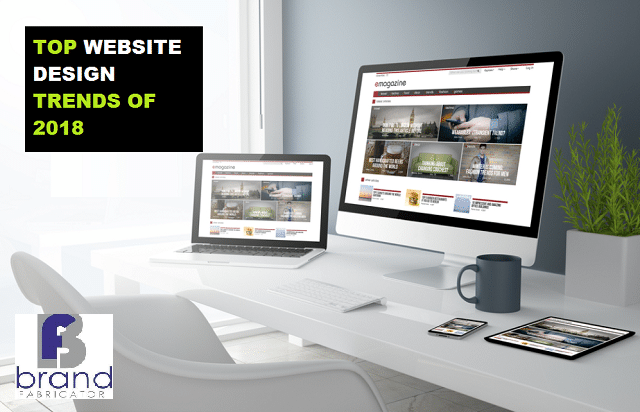 You need to be really sure that your website responds well on both desktops and mobile. Considering that mobiles are being used more than desktops, the websites should be made mobile friendly. Fonts help you grab a lot of attention of the user. Ditch the old basic font and go ahead with the new and unique trending fonts to make your website look more trendy and attractive. These days chatbots are in because of the convenience they provide to the user. It becomes easy for the user of your website to interact with you and helps him clear all his queries and get quotations, etc. The web developers are now more round edges than the old school sharp edges. Round edges add an extra class to the look of the website. These round edged icons are in trend for quite sometime and have gained a lot of hype. We know, we know animation is no new term and is now kind of outdated. But bringing your website into motion and ditching the static images is no bad. You can add some animation to your website and fetch some extraordinary attraction. Not only the website design also one needs to be very particular about the WEB DEVELOPMENT COMPANY one chooses because its the WEB DEVELOPMENT COMPANY that plays a core role in establishing your business online. Make a wise choice while you choose a web development company. If you are looking for one such company then you have landed yourself up on the right place. BRAND FABRICATOR – it is one such WEB DEVELOPMENT COMPANY BASED IN DELHI that provides services from website development to its profitable functioning. The team at BRAND FABRICATOR follows all the trends and gives your website latest look according to the time and need. The team introduces you to all what you need and all what will be beneficial for your business. Trusting Brand Fabricator in terms of both services and trendy eye catching work will be the best ever decision you will make for your E-Commerce setup. Do no more delay, head to Brand Fabricator to know more and enquire about the services.